LIMA, Peru -- Peruvians trying to fathom why their choice for president is now limited to the daughter of a disgraced former president or a leftist military man endorsed by Venezuela's Hugo Chavez may need look no further than the presidential palace. Much of the credit - or blame - could well be due outgoing President Alan Garcia, a veteran political fox barred by law from immediate re-election but who many believe wants a third term in 2016. Many analysts say he expertly finessed the election's first round so a more centrist candidate could not make it to the June 5 runoff. "He wants to return because his life is politics and he adores power. What's more, he thinks he's all-powerful," said Fernando Rospigliosi, a newspaper columnist and former justice minister. Rospigliosi and others say that Garcia, 61, has worked subtly to achieve an electoral outcome that favors his own ambitions: exacerbating divisions among the three centrist candidates rather than encouraging them to rally behind a single candidate. A centrist in the presidential palace would have an easier time anointing a successor acceptable to voters, they argue. Garcia has repeatedly said that Peruvians will never opt for a leftist who would abandon an investor-friendly economic model credited for an average 7 percent annual growth rate since 2001. Two in three voters endorsed that model in the election's first round on April 10. The rest voted for Ollanta Humala, who promises a major redistribution of wealth favoring the 34 percent of Peruvians who eke by on less than $2 day. That was enough for a first-place, first-round finish for the man Garcia defeated in 2006. Garcia, who refused through his spokesman to be interviewed for this article, had been cagey about his ambitions. Then, in a Sunday TV interview, he answered "no" when asked if he would seek re-election. But this "master politician" with "a colossal ego," as a 2006 U.S. diplomatic cable released by WikiLeaks describes him, is not one to sit on the sidelines. Two years ago, Garcia boasted to a gathering of Latin American bankers that he could prevent "whomever he didn't like" from becoming president. He initially backed Luis Castaneda, praising him publicly as the former Lima mayor topped opinion polls last year. But Castaneda proved an inept campaigner and Alejandro Toledo, Peru's president from 2001-2006, became the front-runner. That wouldn't do for Garcia; the two are fierce rivals. Toledo defeated him in 2001 and is closely allied with Fernando Olivera, a politician who gathered evidence alleging illegal enrichment during Garcia's 1985-1990 first term. Garcia never publicly criticized Toledo, but his aides leaked to the media invoices that showed Toledo's presidential palace bought 1,753 bottles of Johnny Walker Black Label whisky. That fueled accusations that Toledo has long denied: that he was an alcohol and cocaine abuser. With Toledo fading, Castaneda out of the running and Humala surging, Garcia began favoring Pedro Pablo Kuczynski, a 72-year-old former World Bank economist and investment banker who rallied late in the campaign but was given little chance of ultimate victory due to his association with Peru's light-skinned elite. Garcia appeared in a photo with Kuczynski's arm around him that was published by a newspaper less than two weeks before the vote. His APRA party then endorsed the candidate, even though polls showed Humala would trounce him in a runoff. Kuczynski's rise came largely at Toledo's expense. He took third, Toledo fourth, and Castaneda fifth. The three together garnered 44 percent of the vote. Giovanna Penaflor, director of the Imasen polling firm, thinks Garcia successfully calculated that by backing Kuczynski he would help Keiko Fujimori secure second place, and a runoff against Humala. Keiko's father, former President Alberto Fujimori, is serving a 25-year prison sentence for looting Peru's treasury and authorizing death squad killings. Garcia has given her a subtle nod, recently saying that voters must decide "whether to go with a radical change in the economic model (a clear allusion to Humala) or go only with a social improvement that puts the accelerator on some things." Keiko Fujimori has now pulled into a technical tie with Humala, according to an Ipsos-Apoyo poll released Wednesday. He was favored by 39 percent of those polled and she by 38 percent. The survey has a margin of error of 2.2 percentage points. 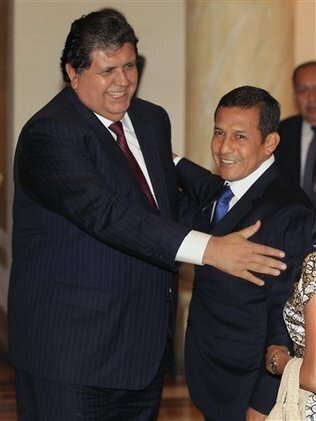 A Humala presidency could be dangerous for Garcia. The retired army lieutenant colonel has promised to prosecute and jail corrupt politicians, and Garcia's government was badly shaken by a 2008 scandal over kickbacks tied to oil concessions allegedly solicited by high-ranking officials. Garcia's chief minister and personal secretary were allegedly involved, and his entire Cabinet resigned. Then key evidence disappeared en route from police to prosecutors. "Garcia has survived and thrived via the indirect threat, ably playing rivals against one another and undermining, with cold calculation, the political bases of potential competitors," the leaked U.S. cable says. It calls Garcia's APRA party "the most effective political machine in Peru," though analysts say it can at most count on the backing of one in 10 voters. Garcia's current low approval ratings make a third term seem unlikely, but anything is possible in Peruvian politics. In his disastrous first term, Garcia saddled the country with runaway inflation and a bloody left-wing insurgency. He declared a moratorium on foreign debt payments, making Peru an international pariah. He went into exile for nine years to avoid the illicit enrichment charges, which he called political persecution by Alberto Fujimori. Yet he was able to return to the presidency. As the U.S. cable noted, Garcia is a man "who lives and breathes politics" and "has never done anything but the work of candidate or president." And now, his approval ratings are up. In March, they were 26 percent, as measured by the pollster Ipsos-Apoyo. After the election, they bumped up to 32 percent. Harvard political scientist Steven Levitsky says that compared to Garcia, the candidates in this year's election "are truly amateurs." "When he campaigns - as he did in 1985, in 2001, in 2006 - it's like the Brazilian national soccer team against some secondary-school team. Men against boys," he said. "The guy knows how to do politics."